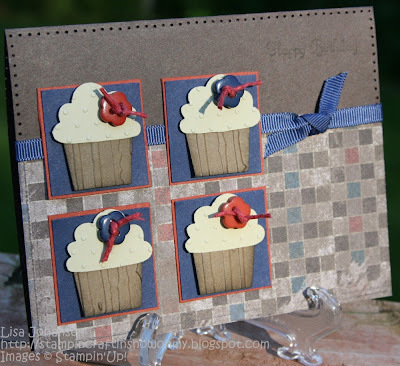 Snowy Moose Creations: Sweet As A Button for Friday Mashup! Wooohoooo, its Friday! My kids started back to school on Weds and so now I can get back into a normal crafting routine during the day. Holly made it easy for me this week with the challenge she is bringing us...Buttons and Cupcakes! Create a project featuring "Cupcakes". Check out the great projects from the Design Team , you may notice that we added in some extra touches... Paper Piercing & Paper Piecing so if your really up for a challenge add one of those techniques into your project as well. And don't forget about our next "Fan Favorite" Challenge. We can't wait to see what your ideas are! If you go to the Friday Mashup blog you can see I went in a different direction than the other designers, going with a masculine birthday card. My cousin, who lives in the Worcester MA area, is turning 17 over Labor Day weekend and its really important to me that I send him a card and recognize his birthday. Our family has been through a lot the last 3 yrs with the loss of my/our grandparents in 2008 and 2009 and my dad in 2010(his uncle) and my aunt, uncle(my dads youngest brother) and cousin are the only blood family I truly have left. My grandparents always sent cards and such for birthdays and other special occasions and I want my cousin to know that we're still here for him and that we're thinking of him. I also went ahead and added paper piercing, going for a full MASHUP on my card! I love your masculine take on a cupcake card. I think this is my favorite dp from the new catalog so thanks for showing me a new way to use it. This is perfect for a man! How clever! I really love your style Lisa. Did I mention to you that I used to live in Dawson City in the Yukon? Have you been there? Great Dude Cupcake card!! That is a sweet idea to keep the cards coming in your family. I remember my grandmother used to always send out a card with $2 in it. I still have those $2 bills in a box. I really like the color combo you used, it looks great with that DSP. The buttons are super cute on your cupcake top. Hi Lisa, I loved your comment on my blog! Very funny. I really like your colour combo here, it's a fabulous masculine card. Cute cupcakes! Great, unexpected colors! Nice to know someone is thinking of the guys! LOL! !